A documentary project following Jennifer as she cycles across the country interviewing everyday athletes and entrepreneurs, and discovers the towns that have embraced bicycle tourism. The documentary will cover the ride and capture the stories of the people she interviews as she makes her way from San Diego, CA to St. Augustine, FL along the Adventure Cycling Association’s Southern Tier. Filming will happen during the two and half months it will take Jennifer to ride her bike across 8 states from the Pacific Ocean to the Atlantic Ocean. The ride kicks off with a ceremonial dipping of her bike tires in the Pacific Ocean and will end when she completes the journey with a dip of her tires into the Atlantic Ocean. 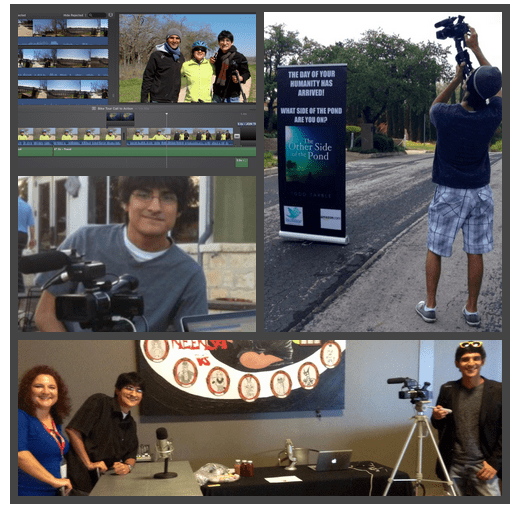 The documentary will be shot by Jonathan and Jordan Navarrete who have 12 years combined video experience filming interviews at large-scale events, conferences and trade shows as well as one-on-one studio and outdoor events. Jonathan has done short film, book trailer and voice-over work. Jordan has been the primary videographer for Jennifer’s multiple speaking and interview gigs for the last 4 years. As an award-winning social media professional, Jennifer has been conducting interviews since 2005 in the early days of podcasting and social media. She can typically be found either on the bike trail, or in front of the camera conducting a business profile interview inside the Social Media Lounge, or with a recording phone app interviewing just about anyone she finds of interest. Her interviews are easily found on YouTube, Ustream, SoundCloud and BlogTalkRadio. Jennifer will focus on three interview topics over the course of the tour: Everyday Athletes, Entrepreneurs and Cycling Tourism. These three subjects speak to the heart of how she lives her life as an athletic entrepreneur who shed 30lbs through an active lifestyle. Her enthusiasm and passion for cycling has encouraged many to jump on the bike trails in her hometown of San Antonio, TX. People who live active lives by participating in charity 5K events to 1/2 and full marathons, bike tours to triathlons and more. These are folks who lead an active life during their early mornings, evenings and weekends. These folks may not consider themselves athletes. Relegating the “athletic” term to Olympians and Elite Athletes, but in living an active lifestyle they are leading an or athletic life. As a long distance bike tourer, 1/2 Marathon, Duathlon and Adventure Triathlete, Jennifer is knowledgable in the physical and mental toughness it takes to train and compete. There are so many ways one can earn a living. What Jennifer continues to be amazed by is just how creative entrepreneurs are in the world. The ability to take an idea, fuel it with passion and creativity is common to entrepreneurs. Many folks wonder how they can make a living without a 9-5 job. For an entrepreneur, there just isn’t any other way to do it. Living a life of your own making is just as powerful as it is daunting. Jennifer is looking forward to capturing the stores of entrepreneurs along the lower 8 states to share the simple yet brilliant way they have chosen to pursue their dreams, earn a living and live their lives. Cycling is booming in cities and towns all across the country. What’s old is new again and there are towns across the country that recognize the value of bicycle tourism. It is no secret that cycling has been a huge part of Jennifer’s life over the last 3 1/2 years. She hopes to shine a light on the cities and towns that have embraced cycle tourism, share their successes and lessons learned so that other towns may adopt cycle tourism as part of their tourism outreach. To see stories of everyday athletes who are training in the early morning, late night and weekends for a charitable cause or for personal success. To become part of the team capturing the moments of entrepreneurial inspiration. To chronicle the successes of towns that have embraced bicycle tourism. With your support we can tell the unique story of one woman’s journey across the nation which will tell the even bigger story of how individuals in this country have found happiness in an active athletic lifestyle, living their entrepreneurial dreams and championing the places that are successfully promoting bicycle tourism.